"From Real Data to Argument Mining"
The 12th ArgDiaP conference is dedicated to argument mining. We will discuss techniques and methods for analyzing real data in natural arguments which will ultimately help us to automatically recognize and extract argumentative structures. Associated with the conference is the 2nd edition of the Interdisciplinary Graduate School on Argumentation and Rhetoric, IGSAR. Students will participate in two days of introductory tutorials (21-22 May) and in the ArgDiaP conference (23-24 May). Thanks to the financial support offered by the Polish Ministry of Science and Higher Education, there is a possibility to apply for grants to cover a registration fee to participate in four days of IGSAR (information are available at the IGSAR website). 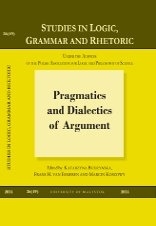 The peer-reviewed papers from the 12th ArgDiaP conference are published as a special issue of the journal Studies in Logic, Grammar and Rhetoric (Katarzyna Budzynska, Frans H. van Eemeren, Marcin Koszowy, Eds. ; vol. 36(49), 2014; De Gruyter). All of the papers are available for downloading (Open Access). Submissions will be reviewed by members of the programme committee (to be announced soon). Notification of acceptance will be sent by 28 April 2014. At least one author of each accepted abstract must register for the conference. We consider a post-conference publication for full papers from both regular and student sessions, yet the details will be given later.